Chicago Teachers Union President Karen Lewis (in hat wearing glasses) talks to reporters about the upcoming union strike authorization vote. The strike authorization vote will take place on December 9, 10, and 11 in all the schools and other CPS locations where union members work. Above, Lewis is flanked by the union officers (Jesse Sharkey, Kristine Mayle, and Michael Brunson) and union delegates during the December 2 press conference. Substance photo by Sharon Schmidt.Officers of the Chicago Teachers Union held a press conference on December 2, 2015 to announce that the union's leadership is recommending that the union's more than 28,000 members vote in favor of authorizing a strike during balloting on December 9, 10, and 11. The officers of the union met with reporters following a unanimous vote of the 800-member CTU House of Delegates earlier in the evening. The House of Delegates had voted unanimously in favor of the strike authorization. 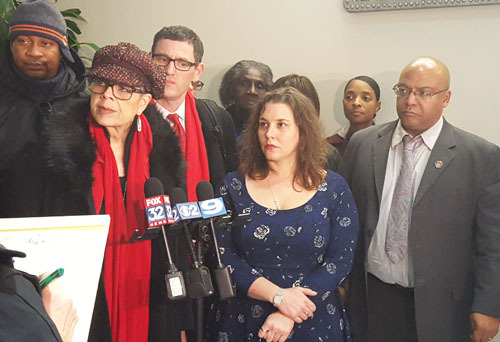 CTU President Karen Lewis and Vice President Jesse Sharkey reminded reporters at the press conference that the union has been working without a new strike since July 1, 2015. The old contract, which was won after a seven-day strike in September 2012, expired on June 30, 2015. At that time, the union offered to extend the contract with nothing changed for one year. Instead of agreeing to the proposal from the union, the Board of Education, which was in transition following the resignation of "Chief Executive Officer" Barbara Byrd Bennett, rejected the union's proposal and demanded that the union take cuts. The refusal by the Board to make the 2015 - 2016 school year disruption free has led the union to the present point in time. 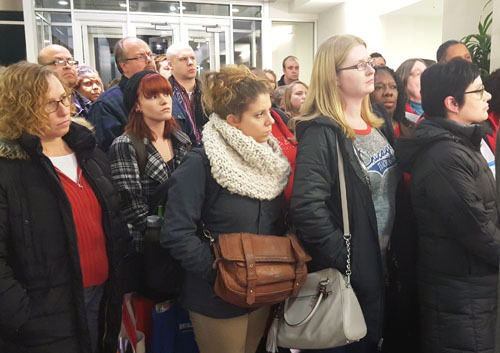 Dozens of union delegates remained after the House of Delegates meeting on December 2 to witness the press conference. The democratic structure of the CTU means that every school has at least one delegate in the school, with additional delegates being elected depending upon the number of teachers in the schools. Delegates are also elected to represent other groups of union members, including substitute teachers, clinicians, teacher assistants, and school clerks. Substance photo by Sharon Schmidt. "We have been negotiating for a year and a half," CTU President Karen Lewis reminded reporters on December 2.